I’m really excited to be taking part in this years Caribbean Food Week. I received this wonderful array of delicious ingredients from Grace Foods UK to create some tasty recipes to share with you all, to help everyone get in the sunshine mood. 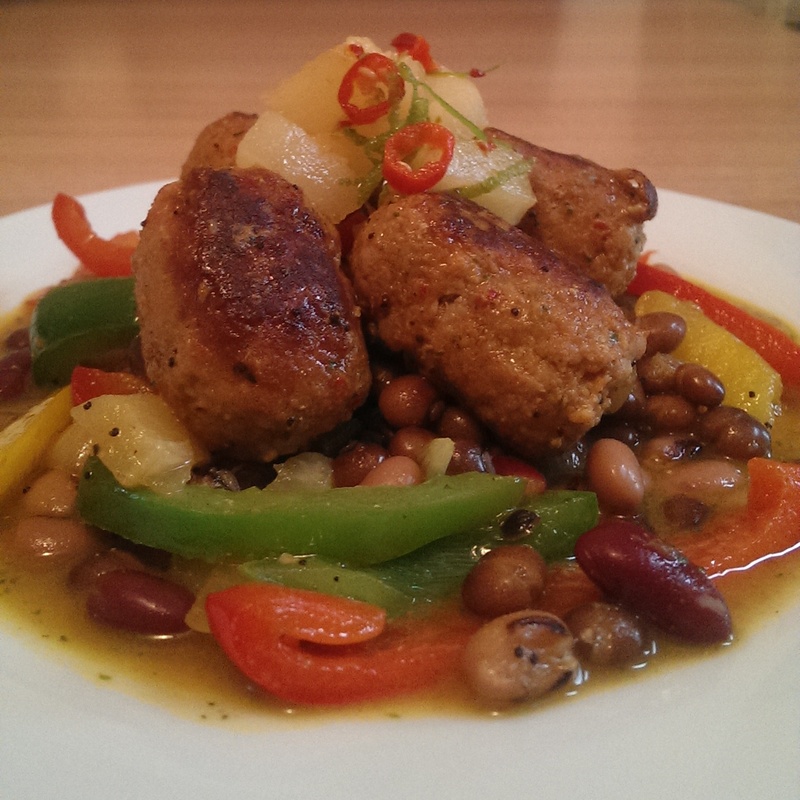 I decided to create 7 delicious recipes, one for each day of Caribbean Food Week. I shall be updating this post throughout the whole week, so keep checking back to see what my recipe of the day is. 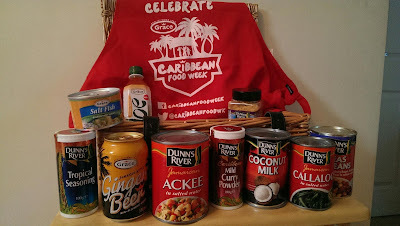 Before I start to tempt your taste buds, here is a little info about Caribbean Food Week and what you can expect during the celebrations. 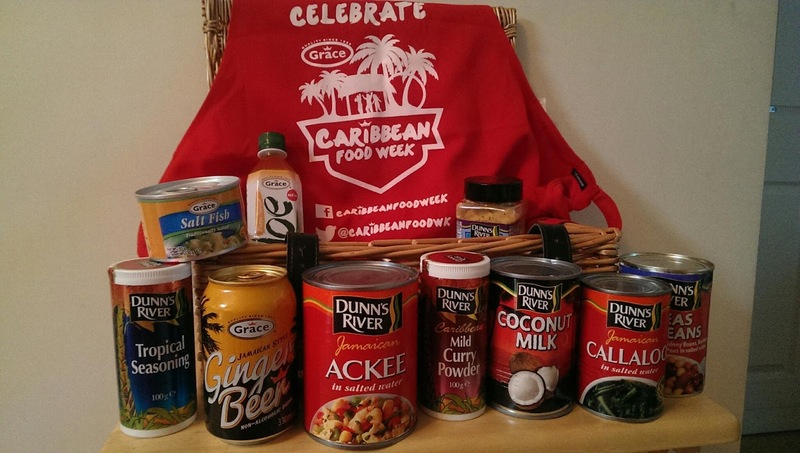 Caribbean Food Week is being celebrated nationally from 24th-31st of September. 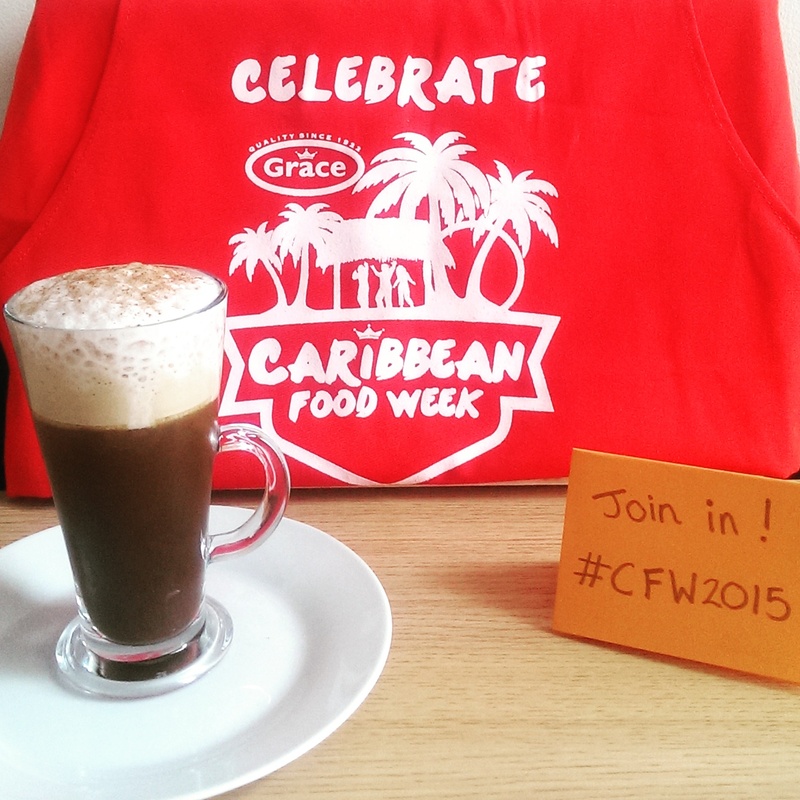 It’s organised by Grace Foods UK, the UK’s number one supplier of Caribbean food and drink. The week will be celebrated with a sampling campaign at locations across the UK, in-store promotional offers and a social media campaign, giving Caribbean food fans the chance to win carnival themed prizes and products. 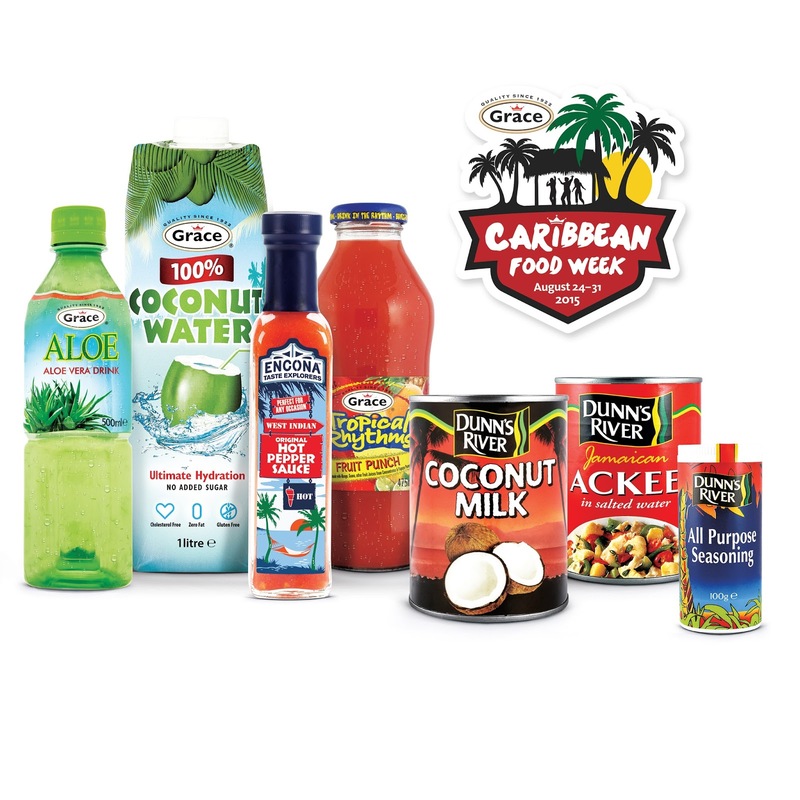 ASDA, Morrisons, Sainsburys, and Tesco stores across the UK will run promotional offers on leading Caribbean products; including chilli sauces, coconut milks, spices and seasonings, coconut water, Aloe Vera drinks and tropical juices. Use these amazing offers as a great excuse to top up your Caribbean pantry. Let’s get this Caribbean food carnival under way……. This dish was really yummy and gave me a taste I had never experienced before. The tropical seasoning tasted awesome, mixed with the pineapple juice, this is a sauce that will get you licking the plate clean. It definitely brought some sunshine to what was a very wet gloomy day here in England! Topped with a chili pineapple salsa. -Drain the pineapple and put the juice aside ( you will need this later). Zest the lime, Dice the pineapple & chillies and mix all three ingredients together. That’s the salsa ready! -Remove the skins from the sausages. Divide each sausage in to two. Roll in to balls. You should end up with 16 pork balls/dumplings. – Heat a large flat based pan on a medium heat and melt the coconut oil. – Add in the pork dumplings and cook for about 10 mins or until golden brown, then add the diced onion. Cook for a further 5 mins, until the onion has softened. -Sprinkle over the Tropical seasoning, add the peppers, peas & beans and pineapple juice. – Cook for a further 10 mins until everything has softened and cooked through. I adore iced coffee. 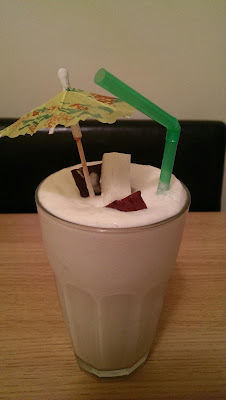 Come rain or shine it’s one of my favourite things to drink and I love experimenting with new icy flavours. So I just had to come up with a Caribbean inspired coffee. 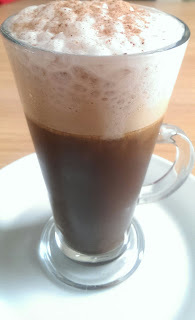 It tasted amazing, even if I do say so myself and the best part you don’t have to drink this cold, it can also be enjoyed just as good served hot. Using a jug blender add in the espresso shots, cinnamon and the ice. Blitz until nice and cool. Divide the coffee into two glasses. Using the jug blender again. Add the coconut milk and nutmeg and whiz until creamy and frothy. Pour over the top of the coffees. Sprinkle with a little extra nutmeg and drink! Yumo! 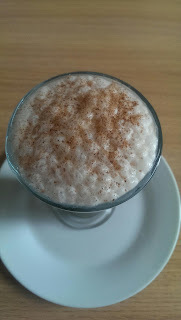 *if you require a little sweetness in your coffee, you can add in sugar, honey or even coconut syrup. Put all ingredients in to a jug blender and whiz it together. Pour into glasses. Pop a straw in. Add some fresh coconut to gain marks on presentation 😉 and voila! If you want a more luxurious milkshake, why not add a few spoons of vanilla ice cream…nom…nom…nom. Today I felt like it was time for a dessert. This was an experiment, so I will be the first to admit that I am no Heston Blumenthal but when one of my experiments goes to plan…I flippin do feel like him teehee. The zingyness (if that’s a word!) 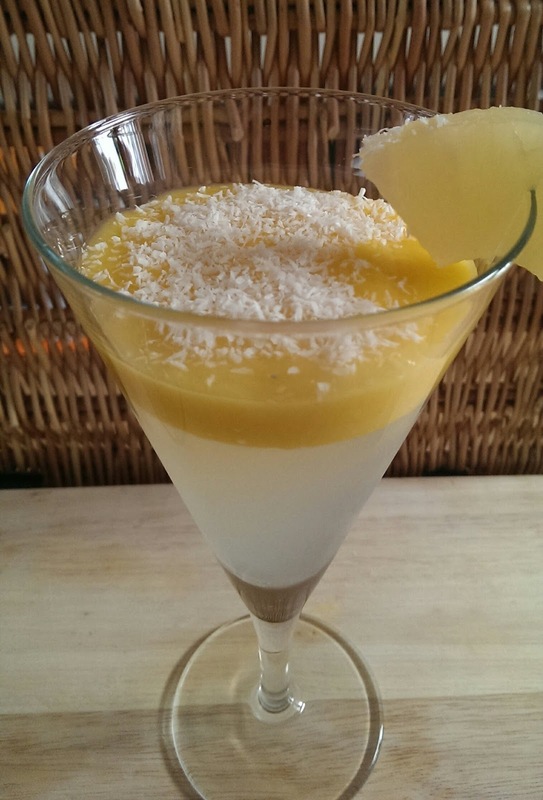 goes great with the sweetness of the mango and when you feel those ginger beer bubbles fizz on your tongue, its a delicious sensation not to be missed. Add the sachet of gelatin to 8 tbsp of hot water. Stir until dissolved. Pour the two cans of ginger beer in to a large jug. Mix in the gelatin. Divide in to 4 glasses and put into the fridge. Blend the mango until silky smooth and pour over the jelly. Finish by sprinkling a little nutmeg and desiccated coconut over the top. Dig a spoon in and enjoy! Day 5 fell on National Burger Day, so guess what? I made a roast….only joking…..I made a burger of course. Being short on time this was a perfect midweek meal. I served it with crispy sweet potato fries and a coconut & vanilla milkshake….because you can not have a burger with out a milkshake, they are the perfect coupling. Take the chicken breasts, place in a plastic bag and give a little bash with a rolling pin. Don’t be too harsh, you don’t want a completely flat breast, it just needs to be thinned out a little which will help quicken the cooking time and then coat each breast with the Jerk seasoning. Heat the coconut oil in a large flat based pan on a medium heat. Add in the chicken. Once nicely coloured on one side, flip them chucks over. In the same pan, add the pineapple slices. After 15 min check the chicken, if the juices are running clear, that means they are cooked. Take them out and pop aside. When the pineapple has gained a delicious brown coating, remove them from the pan also and pop aside with the chicken. In the pan add the 4 halves of the brioche buns to lightly toast. Once toasted remove from the pan. Take the diced mango, chilli, lime and mixed together. 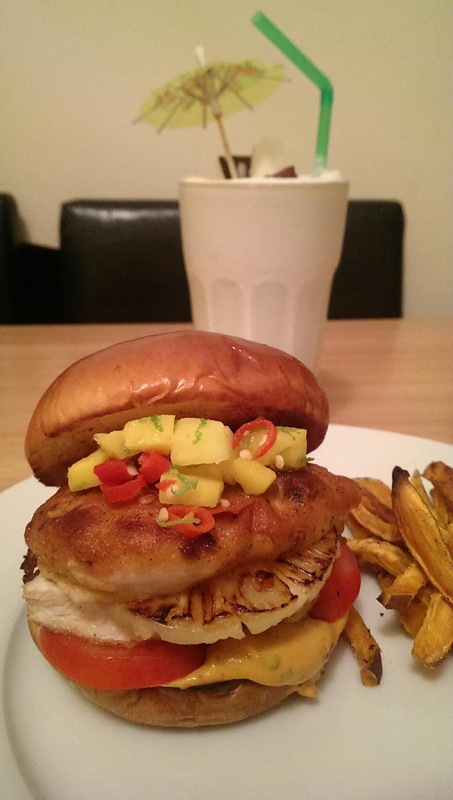 Inside the burger I packed tomatoes, grilled pineapple and a chilli mango salsa. Beautiful! For recipe please visit my bio for direct link 🙂and lime zest and mix together. Now build your burger. In my photo you can see how I layered mine, but please feel free to freestyle it how you wish. 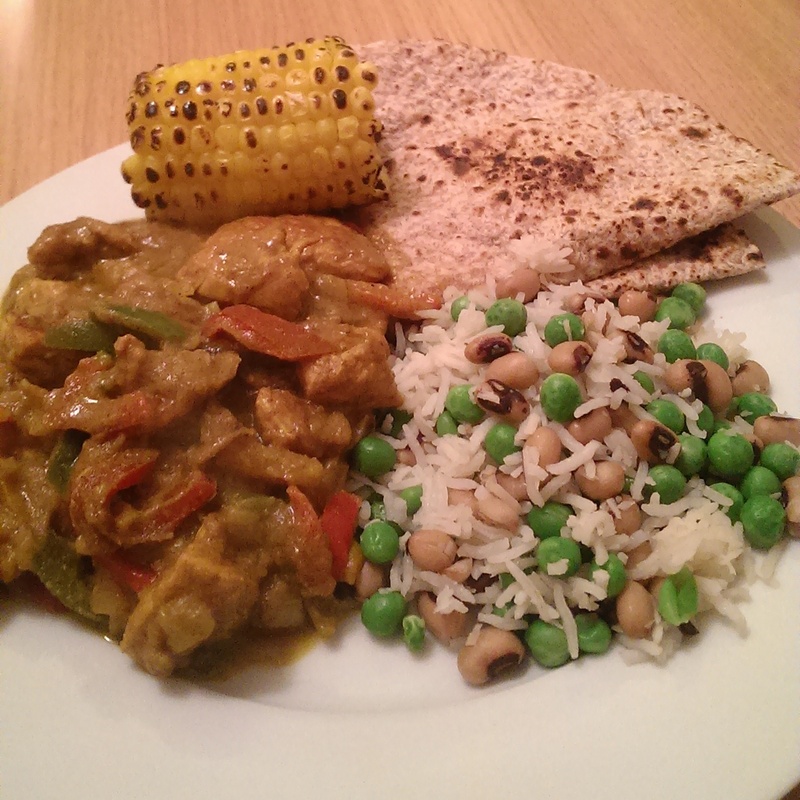 I couldn’t wait to try out the Caribbean Mild Curry Powder, I had been saving it for a Friday night feast. It was a tasty way to begin our bank holiday weekend. This curry was full of flavour and so quick to cook. There were no need to add any additional flavourings because the mild curry powder had it all covered. I served it with a coconut and bean rice, charred corn and a roti. – In advance coat the cubed chicken breasts in the Caribbean Mid Curry powder, place in a bowl and cover with cling film. Leave to marinate for about 30 minutes minimum, it would be best over night. -Melt the coconut oil in a pan and add the chicken. – Once chicken is cooked through add in the onion and peppers. Cook them until they are softened. – Turn the eat down and stir in the coconut milk. Heat through and serve! IMPORTANT!! – day 7 is still being tasted, so be sure to come back tomorrow to see what I have in store for you! Don’t forget you can also join in by using the hashtag #CFW2015 on all social media websites. Search the hashtag too and see what others have been posting too! Previous Awesome Almond Butter Rocky Road – Paleo Friendly! Do you have an email address I can contact you with Lynz? Hey lovely! thank you for your wonderful comment. My email address is JustLynz@hotmail.com – I hope to hear from you soon! You should definitely check out Grace Foods they have so many traditional Caribbean foods. Love this post! I am hungry after eating it…! Everything looks amazing, thank you for sharing.